~Diverse Books 2017: I’m nominating this book for the “Main character with an Invisable Disability” category. In this memoir, Carrie Fisher talks about her struggles with addiction, which is connected to her adult-diagnosis of Bi-polar. It was comforting to read about Carrie Fisher’s struggles because, in a way, they were familiar and foreign at at the same time. We need more people like Carrie Fisher in the world, more people who are willing and able to talk about their struggles with mental health because the more we talk about our struggles, the more accessible they become, and gradually our collective stories will destroy the stigma of mental health. ~Short and Sweet: The paperback and the ebook version are only 176 pages, I found myself consuming this book rather quickly, which should say something as I’ve been in a reading slump recently and have seriously struggled with motivation to read. I consider Wishful Drinking and Shockaholic to be parts 1 and 2 respectively, they’re both short books (both are 176 pages, which is about the same size as a standard manga volume), and if you liked part 1 but don’t want to continue, that’s okay. 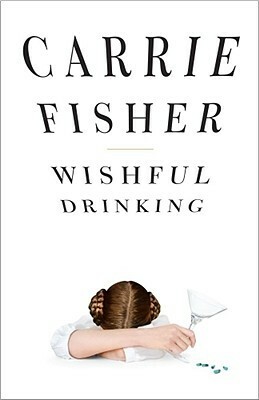 But if you want more details on some of the events and experiences that Carrie Fisher brings up in Wishful Drinking, you can continue with Shocaholic, it’s entirely up to you. ~Make ‘Em Laugh: Carrie Fisher had such an amazing sense of humor, I love and truly admire how she could take such pain and misery, and turn it into something worth laughing about. All in all, it’s a great short read about struggling with mental health and addiction and I think the world can never have too many books like this. Image Description: an illustrated picture of Carrie Fisher as General Organa (from The Force Awakens) standing on the deck of a space-ship with the cosmos and various planets and galactic-bodies in the background. 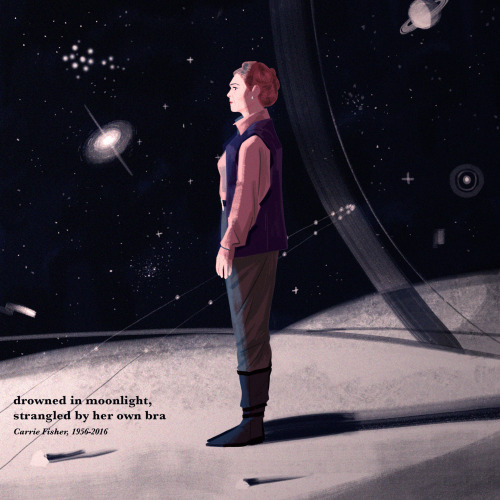 In the corner of the picture is plain black text that reads “drowned in moonlight, strangled by her own bra. Carrie Fisher, 1956 – 2016”.